The success stories of Mark Zuckerberg and Tom Anderson inspired so many people around the world. These days kids having some information and knowledge about internet and social web are keen to make their own social websites and wanted to be the next multi-millionaire Mark. But they cannot find required resources and tools to do so. If you also wanted to create your own social networking website then here are some new tools that will help you to create and publish a full fledged social network of your own. 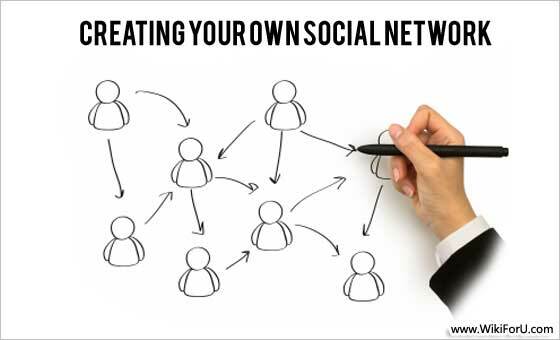 While your friends are creating profiles and pages on other social networks like Facebook, you will be creating a whole network...Isn't that fantastic? And if you are worrying about the amount of money that you have to spend, then don't do it. Because there are also some free social network creating tools also in the list. Although, if you feel need to have some premium features and services then you can purchase a premium tool. These are the top and best tools that are available on the internet and have a lot of good features. Free Social Network Creation Tools: Here is the list of social network creation tools which are available to users for free. Boonex Dolphin: Boonex Dolphin is a nice tool for creating social network of your own. This tool is free to use. But they show credits at the bottom of the page. If you want to remove credits, you will have to pay $99 one time fee. Dolphin gets a lot of new features added in every update. Budypress: If you are doing Blogging from sometime, then you might be familiar with this. And if you ever have used Wordpress before then you might also heard about it. Actually, it is a Plugin For Wordpress Content Management System. Wordpress is more like a Blogging Platform but with this plugin, you can enhance your Wordpress blog and can give it a feel of Social Network Of Users. The plugin is free to use. You need to have a Web Hosting with Wordpress installed. Elgg: Egg is a nice open source tool for creating a website of community. As it is open source, so it is completely free to use and to develop. The Elgg is the best option for creating a more customized social website if you can play a little bit with PHP. If you know how to program, or how HTML, CSS works, you can end up having a fully customized social websites having your desired features. Pro or Premium Social Network Creation Tools:These are the tools which costs some money, either on yearly bases or monthly bases but gives you more freedom over features and services. SocialGo: SocialGo is the most popular Social Network Creation tool on the web. It offers nice features and have simple user-interface, so won't find it hard to organize and manage your social network. They offers two types of accounts-Classic and Pro. The classic has few features and priced at $9.99/month while the Pro has a lot of features and gives full customization control over your network. The price also includes site running charges that is hosting etc. You can choose any type of account and can check and enjoy their service for 14 days without any charges or you can also take the tour without signing up.